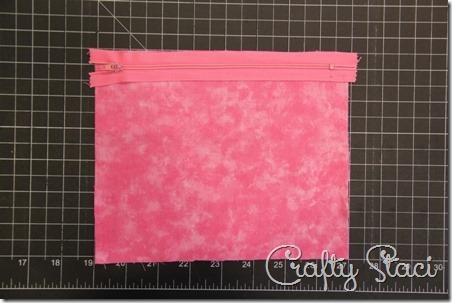 As I promised on my 4th Anniversary Giveaway post from Monday, I’m here today to show you how to make these lined, zippered bags. Crazy easy. These are so simple, in fact, I actually had to look back through my projects to make sure I hadn’t already covered them. I can’t believe I haven’t, but let’s fix that, shall we? To make one, all you need is fabric and a zipper. For a typical purse size, your zipper should be in the 7 – 9” range. Cut your fabric into rectangles the width of the zipper (or slightly smaller) and the height you’d like your bag, plus 1/2”. My zipper was just over 8” from end to end, so I cut my fabric 8” by 6 1/2”. You’ll need two pieces for the outside and two pieces for the lining. Lay one of the lining pieces right side up. Line up the edge of the zipper with the edge of the fabric with the zipper also right side up. Add one of the outside pieces on top with the right size down. Using a zipper foot on your sewing machine, stitch 1/4” from the edge. I don’t know about you, but even with a zipper foot I always end up with wonky stitching when I pass the zipper pull. To avoid that, unzip the zipper a few inches before you begin stitching. Just before you’re about to stitch past the pull, make sure your needle is fully down in the fabric and lift the presser foot. Zip the zipper back up past your needle. Lower the presser foot again and continue stitching. Nice, straight seam! Press both fabrics away from zipper. Topstitch close to the fold. Repeat steps with the remaining outside and lining pieces on the other side of the zipper. Unzip the zipper halfway. This step is important, because if you forget you won’t be able to turn your bag right side out. Open out both sides. Pin the two outside pieces to each other with right sides together, same with the lining. The zipper should fold with the teeth facing the lining side. Stitch all the way around 1/4” from the edge, leaving 3” open at the bottom of the lining. Clip the corners. Turn the entire bag right side out through the opening. Push out the corners. Press the bottom seam of the lining, turning in the opening. Stitch across the bottom close to the edge. You could also hand stitch the opening closed if you prefer. Push the lining into the bag, iron out the wrinkles and you’re done. If you want to get a little fancier, you can make your bag so it will stand up. You can also add a loop if you’d like to clip it to a bigger bag or use it as a wristlet. Cut all your pieces the same, except add 1” to the height on all pieces. Cut two pieces of iron-on interfacing the same size. 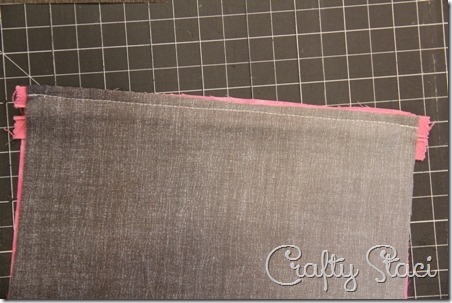 For the loop, cut fabric and interfacing 2 by 4 1/2”. Apply the interfacing to the outside pieces and the back of the loop piece. Fold the loop in half with wrong sides together and press. Fold both edges in to meet the middle. Press. Stitch close to both folds. Continue making the bag and shown above. When you reach the point where you’re pinning the outsides and lining together, fold the loop in half and slip into the seam allowance of the outer pieces, about 1” down from the zipper. Double stitch over the loop for added security. Once you’ve sewn the seam all the way around, stop before turning it right side out. Flatten the corners so the seams touch and pin. Stitch across each corner 1 1/4” from the point. Cut off the excess from each corner. Turn right side out and finish as shown above. These are great for so many uses, take very few supplies and are quick to whip up. Be sure to visit THIS POST before midnight on Saturday, February 15, 2014 to enter to win my anniversary giveaway, which includes one of these little bags!